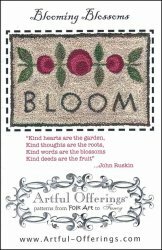 Blooming Blossoms [D6805] - $10.00 : Yarn Tree, Your wholesale source for cross stitch supplies. Punchneedle pattern by Artful Offerings. A sweet and simple project with three pink blossoms, greenery, and the word "Bloom". Finished Size 5.5" W x 3.5" H.